← Can Cali Hit $110 Mil Gross – $30 Mil Tax Rev – in its 1st Week of Legal Cannabis Sales? It’s a busy time of year in Northern California. It’s harvest season and many have hauled tents and sleeping bags up dirt roads to remote gardens – ‘the hill’ as its referred – to harvest, cure, and trim. Our little towns have filled with wanna-be trimmers from the mid-west, Europe, and elsewhere – ‘trimmigrants’ as their known. The European presence is strong this year as many think they’ll be plucked from roadside camps to trim for $200 a pound (good luck, however you say that in French). Here at HU we are on skeleton crew, but there is no-rest-for-the-weary, the approach of legal cannabis is on the horizon and things are heating up. Cali Governor – Moonbeam – Brown signed new medical cannabis oversight into law – providing an avenue for the medical cannabis growers to legitimize themselves. ReformCA filed their recreational cannabis ballot measure with some last minute drama on behalf of the Drug Policy Alliance. And in Oregon, legal sales grossed $11 million in their 1st week, leaving us wondering whether Cali can gross over $100 million in our 1st week of legal sales. Also of note, Bay Area tech big wigs have a target on legal cannabis profits and it’s still untold which initiative these players will throw their money behind. All in all, this thing is starting to move fast and things are getting serious. For growers, the decision to become compliant, start jumping through the hoops, and get in line for a license, is a difficult one to make. Underground networks are well-entrenched and going legit holds its risks. Some growers will decide a do-nothing-approach is best for business. After witnessing the Feds buzz over our heads, threaten our local government, and subvert Mendo’s zip tie program (subpoenaing records and raiding Matt Cohen), trust is an issue. However, as cannabis normalizes nationally, Humboldt is becoming obsolete – a relic from the past, like Appalachia and whiskey. Sure whiskey is still made in Appalachia, but only the kind sold out of vans at NASCAR events. So, unless Humboldt’s cannabis providers want to become the west coast amalgamation of Carolinian moonshiners and New York bound cigarette smugglers – pushing underpriced product for minute profits – it’s high time jump on board. New medical cannabis regulations come into effect January 1st. Also, if Humboldt is going to remain the epicenter of cannabis cultivation than our underground talent must move into the light – promoting our local industry. After all, “you can’t be neutral on a moving train” (Howard Zinn). But don’t worry, through unknown territory, like a train in the dark the Underground Review chugs on… informing and promoting the players of Northern Cali’s materializing cannabis industry. This edition will explore different views on cannabis agriculture (regional and biodynamic approaches); Humboldt States role in the burgeoning legal cannabis industry; we will hash-out the drama between legalization advocacy groups and their potential beneficiaries; and highlight some interesting lessons learned from the Golden Tarp Awards. What in the heck is an appellation? An appellation is a specific geographic indication used to identify a particular agriculture product from a particular region. Think Champaign. Only sparkling wine from the Champaign region of France can be called Champaign. Or Scotch. Only whiskey from Scotland can be called Scotch. New medical cannabis oversight signed into law by Governor Brown provides a section allowing the newly created Bureau of Medical Marijuana Regulation (BMMR) to adopt appellation control – which basically means only cannabis grown in Humboldt County can be called Humboldt grown. This is common in the wine industry where, for instance, wine made from grapes outside of Napa cannot be called Napa wine. Appellation controls allow growers (in lets say Humboldt) to set standards to protect the quality and price of specialty ag production. These controls include regulations on yield, quality, cultivation practice, etc. The point of these regulations is to hold demand and therefore prices high – therefore outside interest (i.e. corporate ag) can be held at bay. Emerald Triangle as a Bioregion? Talking about appellations gets us at HU thinking about Bioregionalism. Made popular by environmentalist Peter Berg – an early member of the San Francisco Mime Troupe and the Diggers – Bioregionalism controversy ignores government created borders in favor of geographic regions divided by climate, geology, watershed, culture, and terrain. A Bioregional approach to environment creates balance within bioregions – harmony between humans, animals, plants, and natural resources. Sustainable relationships with the environment are paramount. Bioregionalism differs from classical environmentalism because it doesn’t view nature as Nature – a pariah that needs to be saved and isolated. It views nature as an ever-changing environment with which humanity must live in harmony. Here at HU we feel this is an important ideological distinction when considering cannabis agriculture in the Emerald Triangle. Does the ideology behind environmental claims view all agricultural development as negative or is balance the goal. Permaculture and Biodynamic approaches to agriculture go hand-in-hand with Bioregional ideology. Biodynamicism and Permaculture view humans, plants, animals, soil, nutrients, and water as a single system. These techniques utilize a cradle-to-cradle process where nothing is wasted and no outside inputs are needed. Do farmers buy soil? Do they? Not usually… But they definitely never throw it away! HU discussed this topic in Cannabis and the Environment: What’s the Intent… We witnessed an amazing amount of cannabis growers throwing away their soil. Sometimes at the dump! Completely wasted… HU begs you, please do not throw your soil away! For one thing, it’s an investment and should be composted, amended, and reused. It’s another (big) thing, that it’s a burden on our environment – dissolving any kind of harmony. Luckily The Ganjier and Dirty Business Soil are here to help (thumbs up). The article From Trash to Treasure, by Sarah Schuette of Dirty Business Soil, demonstrates why it is sometimes warranted to buy soil but never to throw it away! Recently, a friend of HU had issues with soil fertility and decided to take a sample to Dirty Business. They diagnosed the problem and the issue was amended (pun intended). Usually, topsoil’s are a mix of compost, nutrients including manure, and loam soil. To make potting soil you simply add an aeration medium. Once created, potting soil and topsoil should be constantly inoculated with beneficial fungi and bacteria in order to create a fertile environment. Beneficial what? Seth at the Beneficial Living Center has you covered. Check it out! With educational classes, ready made compost tea, and soil amendments; his knowledgeable staff will help you achieve your Biodynamic and Permaculture goals. All while saving money and time by minimizing inputs. Does Humboldt State University help or hurt our local industry? Humboldt’s Institute for Interdisciplinary Marijuana Research (HIIMR) has put out a survey through the Humboldt Patient Resource Center (HPRC) focusing on concentrate use, specifically dabs – and they will pay you $5 to take the survey. Here at HU we took the survey and it seems slightly disconnected. It asks a series of suspicious questions, doesn’t recognize the etiquette of the modern cannabis industry, and generally reflects a cultural and generational gap between surveyors and surveyed. Inquiries sound like questions your 60-year-old doctor might ask… but there are potential benefits of this survey. Helpful info can be gleaned from these questions. For instance the survey asks questions regarding economics and harm reduction… However, this study can also hurt the industry and we must question the intent of the survey… Through the DEA and NIDA, funding and access to cannabis research has historically been restricted, usually to those who find negative conclusions regarding cannabis usage. HU is well aware that HIIMR is seeking funding – as are all research groups – and we hope our local university doesn’t drink the Kool-Aid – criminalizing cannabis for DEA funding. Instead, as we argue in our piece Humboldt Cannabis Industry: More Like Napa or Silicon Valley, we hope that Humboldt State will help find ways for our community to benefit from our proximity to cannabis culture and cultivation. The Golden Tarp Road… Feeling like Toto after the Golden Tarp Awards. HU friends and members reveled at the uniqueness of the event. An event like this can only happen in Humboldt (or Emerald Triangle, its all cool with us)! We are all thrilled with the Tarp organizers and their fearless attempt to change the game – demonstrating that the North Coast is an authority when it comes to cannabis. Organizers from Wonderland Nursery, The Ganjier, and Emerald Growers Association teamed up to push-the-ante in cannabis judging and categorizing. Replacing the ubiquitous indica/sativa dichotomy with flavor based fruit, fuel, floral, and earth – judging these four categories separately. Applicants entries were also rigorously scrutinized for contaminants and many entries did not qualify. It was speculated that local fires and subsequent air borne debris were a major culprit. However beware that fungus, pests, and bacteria can be introduced at any stage. Dirty scissors, dogs, trimmers, or packaging can contaminate cannabis, and if we’re gearing up for legalization, we need to be mindful of the quality expected in legal markets. This entry was posted in The Underground Review and tagged AB 243, AB 266, biodynamic, California, Cannabis, Cannabis Industry, Emerald, Humboldt, permaculture. Bookmark the permalink. Whatever Happened to 4/20 at Redwood Park? We know a lot of individuals opposed prop 64 but I just had three felony charges related to Cannabis cultivation reduced to misdemeanors.. I can't begin to tell how liberated I feel - ready to renew my passport and never have to don the scarlet letter f as all felons do - but I can't help but feel for all the people who are sitting in jail or done time for Cannabis related offenses. To them my heart goes out. 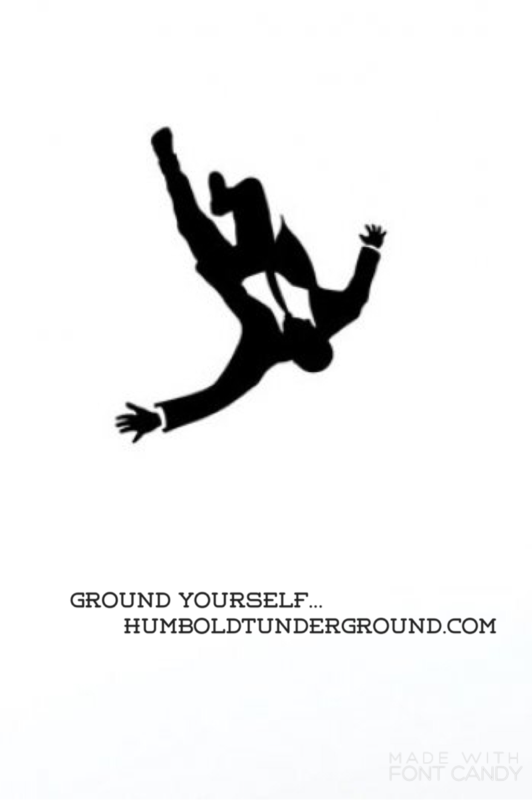 Also of note: the Humboldt Underground is in transition, a lot is going for us at the moment but we are not gone just in deep thought and reflection - figuring out who we are now that weed is legal! Here's lookin at you.. Yikes...!!!? WHAT DOES HEMP MEAN TO HUMBOLDT? Check out our three part series!